Several variations on a tempting summer layered salad. Tempt My Tummy Tuesday…..Summer Salads! Welcome to another summer edition of Tempt My Tummy Tuesday… I am not wanting to heat up the house these days. So that oven is staying off. How about a great salad instead? 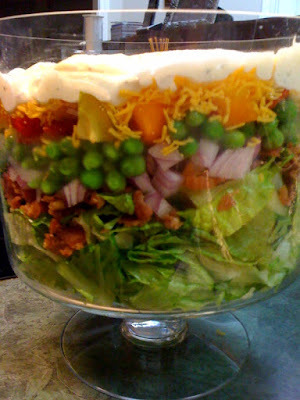 I first shared this 7 Layer Salad in 2009. It is such a family favorite, I thought I would share it again. I also came across another variation this week. I think it sounds wonderful so I am also sharing that 6 Layer Salad variation. Dressing: Combine 3/4 cup mayo, 3/4 cup sour cream and 1 package dry Italian dressing mix. Mix well and pour on top of the salad to seal the salad. Once all layers are completed, seal with plastic wrap and chill up to 24 hours. A new variation on the traditional refrigerate overnight layered salad. Cook pasta, drain and rinse in cold water. Drizzle with oil and toss. place lettuce in 2½ qt glass serving bowl; top with pasta and eggs. Sprinkle with salt and pepper. Layer with chicken and peas. In small bowl, mix dressing ingredients until blended; spread over top. Cover and refrigerate for several hours or overnight. Thank you so much for hosting, Lisa! I agree it is to hot to cook and your Salad looks delicious, we would really enjoy it. Hope you have a great week and thanks for hosting! I loooooove 7 layer salad. Good stuff. Thank you for hosting! This salad looks delicious and very colorful. It really catches my attention and makes me want to try this soon. Thanks! Yum! Love your salad dressing variations, too! Thanks so much for hosting the party, hope you have a great week! Thank you for hosting, Lisa. Ooh, that sounds fantastically cool and summer-time yummy! I’m sharing a recipe for homemade, dairy free Ricotta Cheese. Thanks for hosting Lisa, and have a great week! Yummy looking salad, thanks for hosting! I am SO with you on not heating up my kitchen. It’s summer and yuck! I love the layered salad – you’ve got everything you need right there. Oh I love love love this salad Lisa. Only one problem I love it more than everybody else and eat way too much!! Thanks for sharing and again thanks for hosting all these great cooks. Hi Lisa!!! I am new to blogging and even newer to linking up. Just stumbled upon your blog. I am leaving my link to a homemade peach cobbler that we enjoyed this past week when hubby showed up with bags of fresh peaches from a customer of his. Thanks for having me. Please let me know if there is anything else I need to do to be a part of your linky party!!!! Vanilla Chai Tea Cookies and a Giveaway! Next post: Tempt My Tummy Tuesday… Summer Steak BBQ on a Budget and Walmart Gift Card Giveaway!